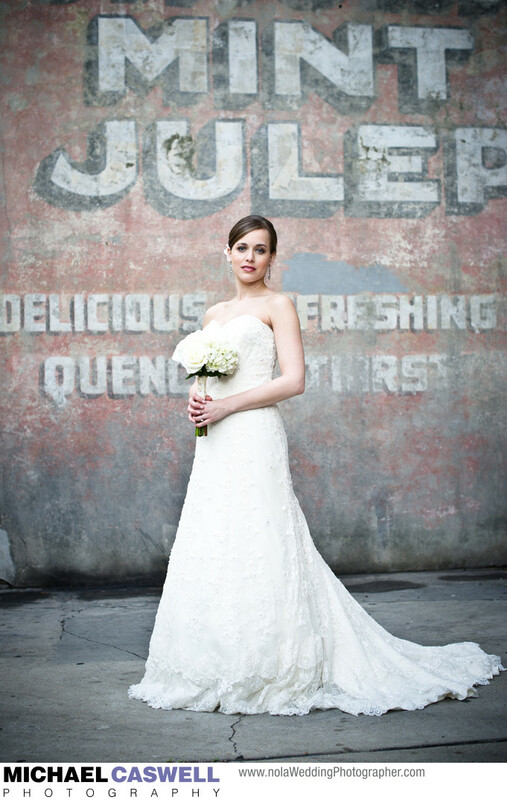 This gorgeous bride loved this old and faded painted wall advertisement, so we made sure to stop here during our bridal portrait session in the French Quarter. This advertisement appears to date from around 1922, and is an interesting piece of New Orleans nostalgia that has survived, weathered but still recognizably intact, for nearly one hundred years. There's something quite appealing about the juxtaposition of a gorgeous bride and an old weathered facade full of interesting textures. The Vieux Carre is full of innumerable great locations for bridal and engagement portraits, with interesting architecture, gritty textures, and lots of character. Though I've photographed many portraits in this historic neighborhood, I still regularly stumble onto previously unnoticed spots. The mild temperatures of Spring and Autumn make these the best and most comfortable months for outdoor bridal portraits in New Orleans. This session took place on a beautiful March afternoon. Location: 317 Decatur St, New Orleans, LA 70130.